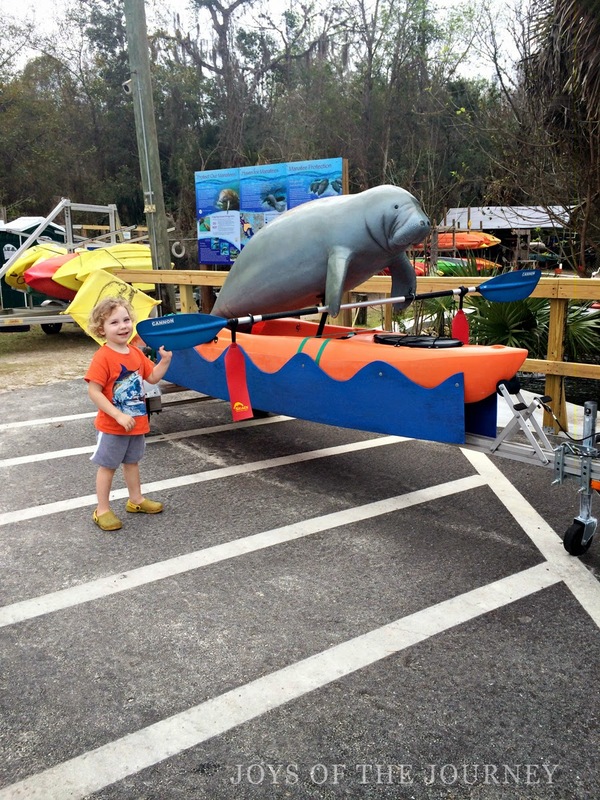 In the winter, manatees flock in high numbers to the warm, shallow waters of the Crystal and Homosassa Rivers on the west coast of Florida. From November to March, there is a greater chance of seeing the manatees in the wild in these areas and since we live only about 1 1/2 hours from Crystal River, I wanted to check them out with my family before they started to spread out. At first, I was a little wary about taking my rambunctious 3 year old out in the river on a kayak. We have a boat that he is used to going out on, but there is room to move and walk around, unlike a kayak. Nonetheless, we planned the trip anyway and I'm so glad we did! My three year old was totally enthralled in the nature, very observant, asked tons of questions and learned so much! We did see some manatees and lots of different species of fish (the water was crystal clear in the spring), birds and plants. The river we went on was shallow in alot of places. If my little guy started getting antsy, we stopped and let him get out and wade around in the water. After a few minutes of splashing around, he was ready to get back in and go for another ride. We took turns snorkeling while he played! If my little guy is snacking, he's happy. We brought lots of water, fruit and crackers for him to eat while he was enjoying the ride. 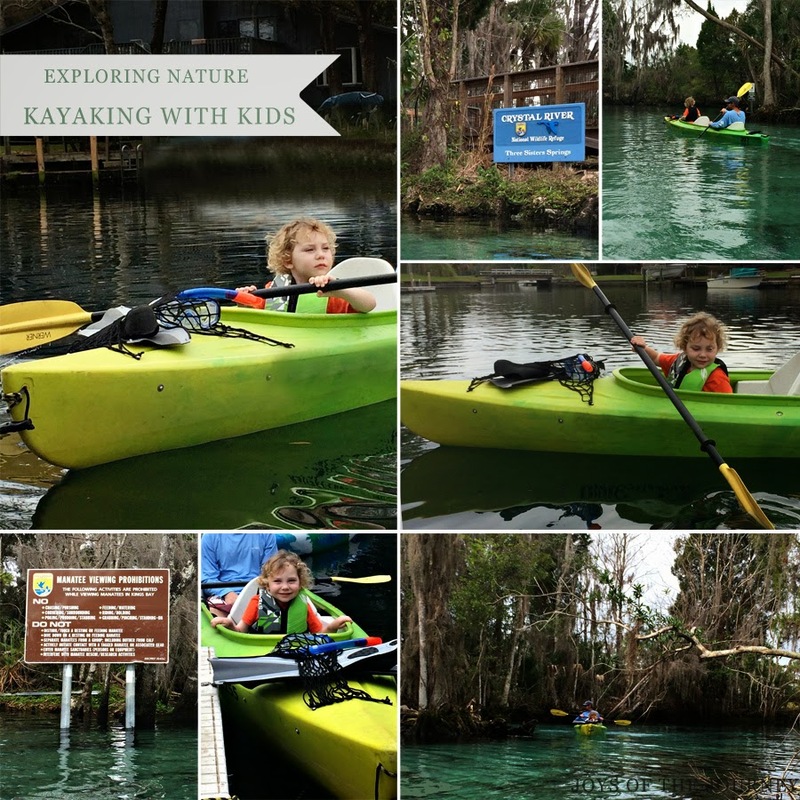 With smaller children, a canoe or sit inside kayak is the best option. My hubby and son got the double sit in and it was perfect. Older kids might prefer a sit on top kayak as long as long as the waters are calm. We planned on a two hour trip, but were prepared to leave earlier if we needed to. Fortunately, my little guy did great and we could have even stayed longer if we wanted to, but I didn't want to push it. We had a map of the river which showed us the different paths we could take and our current location so we always knew how far we were from the docking area. Don't forget life jackets (although most canoe and kayak rental places will provide them), hats and sunglasses, water shoes, sunscreen or sun protective clothing, bug spray, towels and plenty of water and snacks. We also like to bring binoculars, birding book and journal, snorkeling gear, and fishing poles! With the right preparation, kayaking or canoeing on the river is an enriching experience for everyone. We had fun spending time as a family and learning and experiencing new things together. There is no better way to teach kids about nature than actually being out in it and observing it for themselves! Great ideas. I miss canoeing in Florida. We never got to take our son when we were living there. Thanks for sharing. Thank you, Mae! There are so many great places here. We still have many more to explore! Anyway, just found your blog, and I love it! I'll definitely be using these tips when my daughter gets a little bigger! Natalie, Thanks for looking! I've always wanted to visit Charleston! Your town seems like it is alot of fun, too! Hopefully you will be able to come and visit. Definitely plan in the winter to see the manatees. It is a beautiful sight!! This looks awesome! We are always looking for fun new ways to enjoy the outdoors! Thanks for sharing on Makeovers & Motherhood's Welcome Party Wednesday Link-Up! Pinned.